Taiwan may be a small country in Southeast Asia but it has no shortage of amazing sights for travelers to explore and experience! For instance, you will find 3 stunning Northern Taiwan attractions that are not too far away from Taipei: the natural wonders of Yehliu Geopark, the undying charm of Shifen Old Streets, and the historic mountain town of Jiufen. The best part? You can explore these destinations in just one day at a very affordable price — thanks to KKday’s well-packaged day tour from Taipei! I had the chance to go through this tour myself and it was one of the most memorable experiences that I did when I was in Taiwan! This is especially because it has always been my goal to visit Jiufen; the so-called famous town that inspired Miyazaki’s famous Japanese animation movie: “Spirited Away“. To add, this trip surely took the hassle away on transiting from one location to the next; so, it’s really great for those who want the added ease (and also great for those who might be pressed on time whilst exploring Taiwan). The only things that are not included are personal expenses (souvenirs), sky lantern costs at Shifen (if you want to set off those lanterns, they’re priced starting at USD$3 or Php 160~ which is already good for 4 people), Yehliu Geopark admission (costs only USD$2~ or Php 135~), and meals. When is the best time to visit Taiwan in order to do this tour? Taiwan enjoys 4 seasons, but they’re not as pronounced given that it generally has a humid subtropical climate. The seasons are divided in the following months and it’s best to either visit in late spring (April to May) or autumn (best in November) if you want more comfortable temperatures. I did this tour in August and it was a tad too warm for me (I sweat very easily). What are other things that I can do while I’m in Taiwan? Where to best stay (for accommodations) in Taipei? Is there someone here who speaks English? : Chia(nasal) mng, jia u lan ehiau gong Engi bo? Before I begin with the itinerary guide, if in case you’re more of a visual person, you can already watch my travel video/vlog below that features this day tour! (Start at timestamp 00:52). This geopark is located in the Wanli District of New Taipei and it is also called as the “Yehliu Promontory”. Basically, it consists of a breathtaking cape that is dotted by a number of unique and strange geological formations — a sight of which tourists in Taiwan would typically want see with their own eyes. Stretching at about 1,700 meters into the ocean as a part of the Daliao Miocene Formation, its interesting sea bays are said to have been actually formed due to thousands of years of geological forces that kept pushing the Datun Mountains out of the sea. A number of the rock formations that are found here in Yehliu Geopark were given names that aptly corresponds to their perceived shape. Some examples of these are Fairy Shoe, Japanese Geisha, Ice Cream Rock, Elephant Rock, and Princess Head. Rest assured, in order to explore these formations, there are well-marked and well-made wooden paths and bridges from the start of the cape and up to its end. NOTE: For a complete list of the unique rock formations in Yehliu Geopark, go here. However, if there is one rock formation that is regarded as iconic not only in Wanli but for the whole of Taiwan, it would be the “Queen’s Head” (女王頭). Truth be told, this is a kind of ‘mushroom rock’ in geological terms; but, it has been given this name because after a top part of the rock fell sometime in the 60s, one side of it started to look like the side face of Queen Elizabeth (and others claim that the other side looks like Nefertiti, the Great Royal Wife of Egyptian Pharaoh: Akhenaten). It is so far assessed that the age of this rock is about 4,000 years old and nowadays, the geopark gives extreme care in preserving this unique rock, more so that the narrowest part around its “neck” is only about 54 inches now. It helps to note that in order to get a picture of the Queen’s head, there would often be a long queue. However, since this KKday tour brings you to this geopark in the early hours of the morning, the line is not as bad. If you want to travel to Yehliu Geopark on your own, it’s best to take a bus from Taipei Main Station’s Taipei West Bus Station (Terminal A). Once there, go to the KuoKuang (國光) window and purchase a ticket to Yehliu Geopark for only NT$96 ~ one way. (The journey will take about 90 minutes). Shifen is a quaint village found in the Pingxi area of Taiwan and it is an old railroad town that originally transported coal. Today however, its Old Streets have become a popular destination for its food, charm, and old train tracks; but also most especially because of its sky lanterns! Explore the Old Streets. Shifen has a collection of lanes and alleys in and around the Shifen railway station area, and what’s most interesting of all is that the train track runs straight through the middle of the village — so do take your time in doing photo ops! However, do remain to be mindful because a train line still regularly runs through the tracks (around every hour); then again, there’s no cause for excessive worry because the train runs slow and villagers will also usually notify everyone when the train is approaching (apart from the fact that the train’s sound is enough of a signal to let you know that it’s coming). After you had your fun exploring the town, make sure to stop by one of the shops to release a Chinese sky lantern. This was once used as a signaling object for the railroads, but nowadays, visitors can buy them in different colors and write their wishes on it with a brush before releasing it to the sky. All of the shops by the train tracks sell it at a standard price of NT$150 (or US$5~) if you want your sky lantern to be in only one color, or NT$200 (or $6.5~) for a 4-colored one. Each of these colors represent different meanings to best portray your wish, may it be for family, love, wealth, etc. The shop owners usually provide you with a laminated sheet that explains in detail what the various colors would mean. Since it is very cheap, my companion and I chose to get a 4-colored lantern for the both of us and we each had 2 sides to write on. (In fact, 4 people can already share 1 lantern). TIP: Every year, a Sky Lantern Festival is held in Shifen’s square (next to the Old Street) in which thousands of sky lanterns will light up the sky in either February or March (check their website for official dates). These were originally released to signal safety or to transmit information but on this festival day, much like what visitors do in Shifen on a normal day, the lanterns are decorated with wishes by each of the people attending the event. This is one of the 3 popular lantern festivals in Taiwan and it has been regarded as a highly recommended activity by big publications like Fordor and CNN Travel. Eat. Eat. Eat! As a marketplace, the Old Street in Shifen is full of restaurants and small stalls selling Taiwanese fare. Since you will have a long stop here during this day tour, you can have your lunch here — OR, you can just feast on a few snacks and get a late lunch/dinner in Jiufen later on. Some of the xiaochi (snacks) that you must try are bubble tea, sausages, fried squid, peanut pancake, and Taiwanese sausages among many others! Glimpse at Jingan Suspension Bridge. Found near and behind the Shifen Station, this pedestrian bridge connects to the Nanshan villages. If you still have time, other than taking Instagram-worthy photos on the bridge, take the chance to explore the colorful houses in Nanshan. Shifen Waterfall. This is a 20-meter tall waterfall found outside of Shifen and it can be reached in 20 minutes by walking or in just 5 minutes by motorbike (there are rentals near the train tracks in the Old Street costing NT$200 per hour or US$6~). Why bother making a stop here? Well, it is regarded as the most scenic waterfall in Taiwan and a rainbow even often displays itself as the water splashes into the lake. If you want to travel to Shifen on your own from Taipei, from the Taipei Main Station, take a northbound train that heads to Ruifang Station (NT$47~ to NT$82~). Get off there and transfer to the Pingxi Line wherein it’s best to get a One-Day Ticket at just NT$52. Once a prosperous isolated gold mining town during the Japanese occupation in 1893, Jiufen is now a popular tourist destination that’s famous for its maze of alleyways that are filled with quaint scenes and teahouses. You will not only find picturesque streets and buildings adorned with red lanterns, but also some great spots for viewing the Pacific Ocean! In fact, there are still structures in Jiufen that remain unchanged up to this day, which then helps show the Japanese influences on the island. 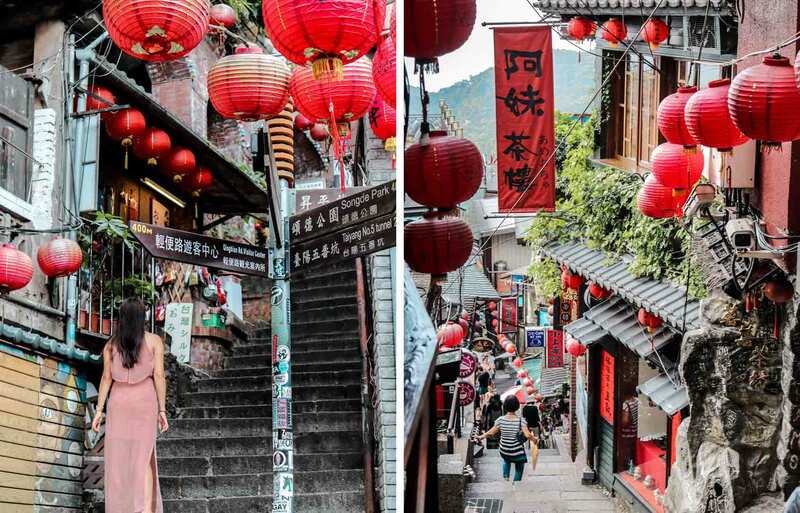 Moreover, due to such a wondrous setting in this town, Jiufen has also actually been a great inspiration for several international award-winning movies such as Hayao Miyazaki’s ‘Spirited Away‘ and Hou Hsiao-hsien’s ‘A City of Sadness‘. Therefore, movie buffs and Studio Ghibli fans must make this a MUST in their Taiwan itinerary! Jiufen is built on the side of the hills so be prepared for a climb up some steep steps until you reach the main section of Shuchi (Shuqi) Street’s cobblestone steps. This street is filled with a wide variety of cafés, historic buildings, restaurants and shops — but don’t forget the streets that run perpendicular to Shuchi, namely: Jishan Street, Quiche Road and Qingbian Road. Shengping Theater. This a small olden theater near the entrance of Jiufen’s main street section, and a visit here (FREE admission) will take you to a trip back in time as you witness its old-style ticket window, film posters, and snack shop. At a regular time intervals, Shengpin Theater also showcases old movies and Taiwanese operas in which visitors are free to watch. Songde Park. A small memorial park which you can find in the eastern part of Jiufen on Qinbian Road. It’s a great place to relax and you can find some monuments that were built in commemmoration of Yen Yun-nian, the person who founded Jiufen’s mining culture. Wufan Tunnel. This is found next to Songde Park and it has been excavated since 1927. But by the early 70s, the Republic of China sealed all mine tunnels in Jiufen to protect residents and visitors. Anyhow, you can still view this tunnel from the outside. Jiufen Teahouse. This is the most prominent building that’s often featured on photos of Jiufen. But apart from its beauty, this Jiufen Teahouse was also once a famous meeting place of a lot of Taiwanese writers and artists when it first opened. Once you’re inside, you’ll be rewarded with calm interiors filled with tea paraphernalia, and if you happen to be there on a good day, you can sit back and enjoy Jiufen’s sights on the terrace. Grandma Lai’s Yuyuan. Found at No. 143 in Jishan Street, this place is famous for its taro balls. (Otherwise, there’s Ah Gan Yee and it even gives you great views over the whole of Jiufen). City Of Sadness Restaurant. Found in 35 Shuchi Road (which is just on the corner of Shuqi and Qingbian Roads) this restaurant is famous for being featured in the highly acclaimed film: ‘A City of Sadness‘. As this Jiufen tour ends, your KKday guide will give you the option to either stay or come with the bus back to Taipei after approximately 2 hours of walking through the town. If you ask me, I highly suggest staying behind so that you can witness Jiufen during the night — besides, the whole place just transforms into a whole other magical place for as soon as all the red lanterns start to light up the streets. Rest assured, going back to Taipei from Jiufen is easy as it’s very close to the city. ~ Go first to Ruifang Station by taking a train heading north from Taipei Main Station (NT$47~ to NT$82~ one way). From Ruifang Station, head to Mingdeng Road (to your left after you exit the station, facing the Wellcome Supermarket). You will then find a bus station named Local Residents Plaza (區民廣場) which is just next to the police station. There are routes 827 and 788 heading to Jiufen (while route 825 operates only on weekends) and it takes only NT$15 to get to Jiufen in 15 minutes. Take note that the bust stop next to the police is the one that heads east to Jiufen, the one across the police station heads west back to Taipei. To go back to Taipei from Jiufen, just take bus 1062 which lands near Raohe Night Market — a great stop to end your night perfectly. ~ From MRT Zhongxiao Fuxing (either Brown Line or Blue Line), exit from Exit 1 and take bus 1062 (Keelung Bus) that heads to Jinguashi. Stop at Jiufen bus stop. This takes about an hour and costs NT$102. This day trip definitely gives you the chance to see the highlights of Northern Taiwan in a kind of tour experience that gives you the utmost ease and comfort. So what are you waiting for? Don’t miss out on this amazing deal via KKday! And don’t forget to use my promo code IAMAILEEN to save 10% off. Enjoy! What do you think of this Taipei day tour with KKday? Which of the 3 do you like the most? Why? Bookmarked! Visiting Taiwan next month, thanks for all these tricks and tips! Following you now! Cool! Thank you, Reah. Enjoy your trip and I hope this helps! 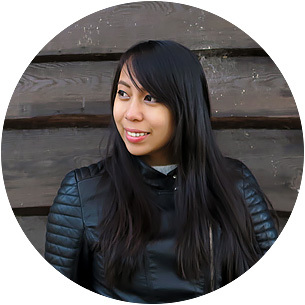 your blog are always amazing! keep it up! Wow, you really captured the culture in your pictures. I am interested in traveling to southeast Asia and hitting up Bangladesh, Myanmar, Laos, Thailand, Vietnam, Cambodia, Indonesia and the Philippines. I’d love to do it all in one trip. I read your blog post on 24 hours in Bangkok and thought it was quite useful. I am SO jealous of all your travel! LOVE reading your blog. Aw, thank you so much Rebekah! Wow! This seemed like such a fun trip. Taiwan looks so beautiful and is one of the countries on my travel list. Thank you for this helpful information. Can’t wait to make my way there. I hope you do — soon! I really like your question-and-answer segment. I found that very helpful and informative. You are quite detail-oriented, which is helpful in traveling. Thanks, Melanie! I often have those questions when traveling and always had a tough time not seeing the info in just 1 place haha, so I wanted to do it for my blog. What a great deal and also a great day tour to see so many great things. Thank you for all of the details. I hope one day my husband and I can make a trip to Taiwan. The waterfalls look so pretty!! You know, I've never really thought in great depth about visiting Taiwan, or any of it's surrounding countries. It's not that I don't want to, it's just not something that is in the forefront of my brain. This post changes that-it's all so amazing! It would be so cool to see all of that! That Queen's Head rock looks so cool. Even if the neck has shrunk to 54 inches, which is still nothing to sneeze at. I am amazed by the range in this little country, as the place has so much to do and see, from different landscapes, cities, tours. That $32 is really awesome too. Downright cheap for the quality of the tour, as a $32 tour anywhere on earth is good money well spent. I'd expect $100 minimum. Good deal. Thanks for the rocking share Aileen. Indeed! But yeah as it's very fragile, there is a guard that's usually on standby when tourists come in to take photos. I hope you get to do this kind of tour, Ryan. Thanks again! What a great travel guide! You literally included everything we need to know and where we should consider going! I have always wanted to see Taiwan but didn't know where to start!